When the Zombie Tarot by Paul Kepple and Stacey Graham arrived through the post yesterday, I was delighted to discover that the LWB (Little White Book – card sized booklet containing card meanings) included a relationship Tarot spread. 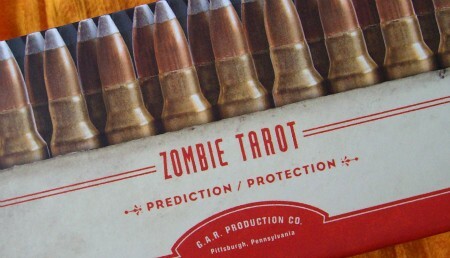 All these details make it very hard not to fall in love with this deck and if you already have a thing for Zombies this may well quickly become your favourite working deck. The relationship spread looked promising. I like heart-shaped layouts. 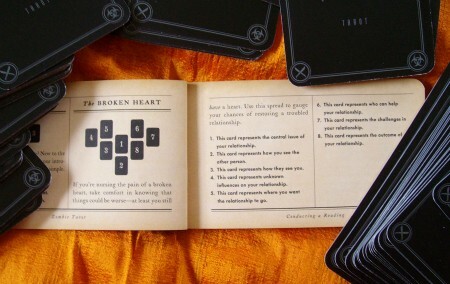 Some of you may recall my ‘Heart of the Relationship Tarot Spread‘ which is a larger spread (14-15 cards). The Zombie Tarot Broken Heart spread can be used for a relationship that has just ended but there is hope of getting back together or for a relationship that is going through a rough patch. It gives a good, thorough overview of the relationship without going into too much detail if you struggle with large spreads. 1. Central issue – King of Hazards (Pentacles): Hard work and money worries might be creating distance between you. 2. How you see the other person – The Magician: You see him as a bit of trickster and not always liberal with the truth but very skilled in his line of work. 3. How they see you – Page of Wands: You inspire him and he’s drawn to your charismatic personality. 4. The unknown – Page of Cups: A child, the birth of a child or an unexpected pregnancy could affect the relationship. 5. Where you want the relationship to go – The Wheel of Fortune: You want the relationship to grow because it makes you feel expansive and ‘lucky.’ Together you will be able to achieve more than each on their own. 6. Who can help – 6 of Hazards (Pentacles): Make sure you prioritise spending time together as much as you prioritise being successful at work. ‘Il faut cultiver son jardin.’ The garden of your relationship needs attention! Not enough energy has gone into creating relationship beauty and harmony. Your relationship garden is overgrown with weeds of discontentment. This can easily be fixed if you find that lawnmower zombie! 7. Challenges in your relationship – King of Cups: You’re both feeling swamped and like there’s not enough to go around. You should be able to swim freely in the ocean of love but you’re tied down by obligations. 8. The outcome of your relationship – 2 of Wands: This relationship can definitely be rescued. If you work at restoring balance and harmony, you’ll become a formidable team, as you are both driven and motivated to succeed. The love is there but the emotions aren’t flowing freely at the minute due to both of you putting too much emphasis on work and not enough on nurturing the relationship. 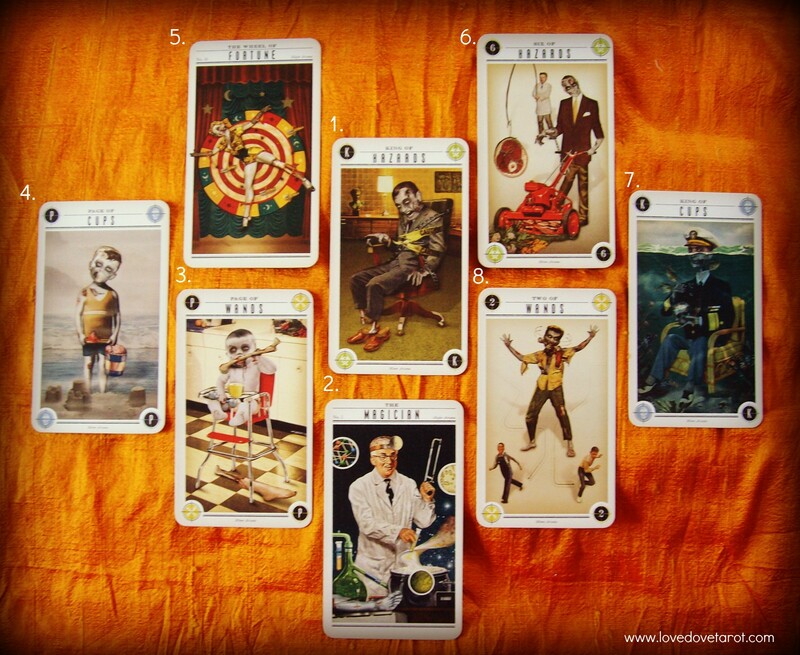 Addendum July 2015: Three years on and this is one of my all-time favourite Tarot decks. I feel it hasn’t received the recognition it deserves – Pure genius!